Home CRRRITIC But is it Art? How about a wall of flowers? 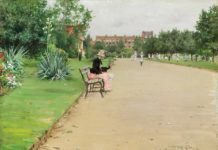 Recently, several Facebook friends have issued pleas for “palate cleansing” posts, preferably containing puppies and other cute animals or anything innocently funny or endearing. The idea is to get a break from the barrage of horrifying/despicable/sinister images and information that have been flashing through our social media feeds for the last twenty months or so. At the same time, I have noticed an increase in botanically themed murals. 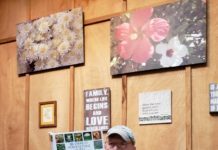 There are several artists who are creating spectacular examples of these, including Mona Caron, who is perhaps best known for gigantic murals of commonly occurring wildflowers in her Weeds series. 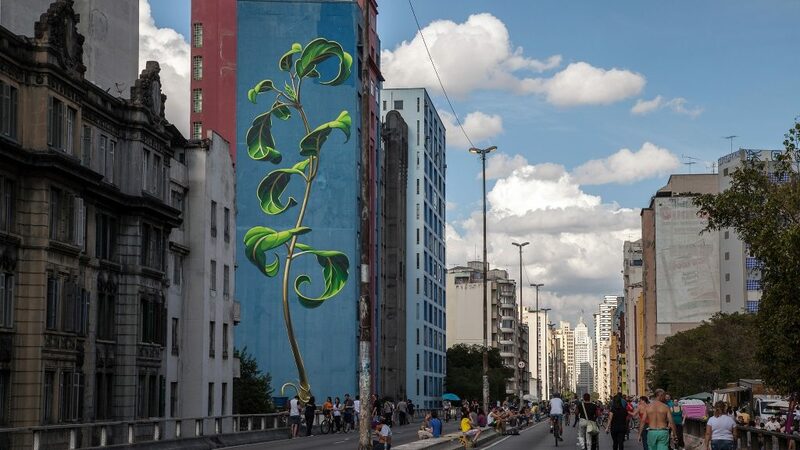 These include a mural of Chamerion angustifolium on the side of building in Portland, and a mural loosely based on Achyranthes aspera in São Paulo (shown above). The first mural in the series, The Botanical Mural, in San Francisco, is 292 x 4–17 feet in size. By hugely magnifying and beautifully depicting tiny plants often found growing in sidewalk cracks, Caron pays tribute to their resilience and prompts passers-by to maybe pay a little more attention to urban vegetation they’d otherwise ignore. 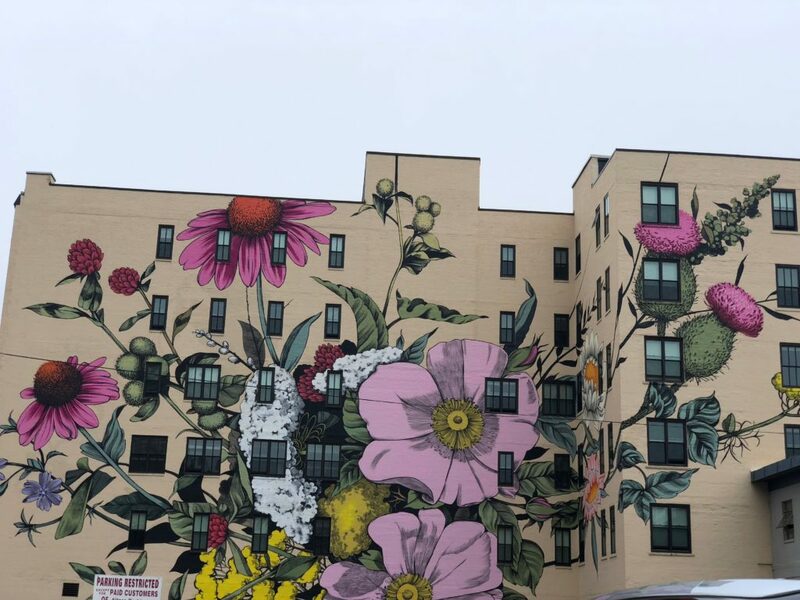 Some of us had been hoping for a Caron mural in Buffalo, but we were surprised this summer with equally beautiful wall art from another artist, Detroit-based Louise Jones, whose Wildflowers for Buffalo, located near our downtown library, is, at 80 feet tall by 160 feet wide, the largest piece of wall art (and there are many) yet seen here. It’s been a social media darling for weeks now, deservedly so. Jones chose wildflowers she knew to be native to the area, as well as some personal choices inspired by what she saw in local gardens. You can see more examples of her art here. 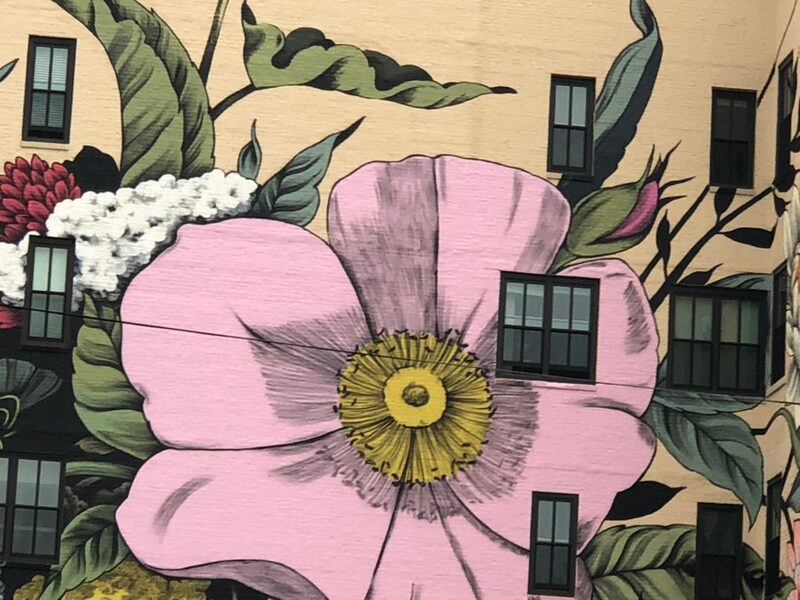 I think that huge paintings of flowers where they’re not expected—on urban walls, often where the nearest park might be a couple miles away—serve many purposes. They do remind us what we’re missing when we’re immersed in the built environment, as we so often are. And they remind us of what we’re deliberately destroying when we choose to prioritize human convenience over the natural environment. 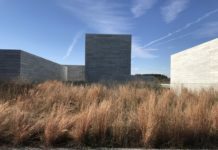 As an overstressed planet reacts to increasingly severe hurricanes, floods, wildfires, and other instances of natural disasters, the built environment suffers accordingly. Will painting flowers on our walls mitigate anything? No, but they are pretty—and perhaps useful reminders that are hard to miss. Love them! Thx for the beautiful distraction. I live so close to the action here that it’s good for me to look almost anywhere else. Love this trend! It would be nice to see Rochester opt in on this. I love it. Great way to beautify a city.